“What Great Looks Like” is a term I use to describe our goal as a team as it relates to how a team should physically play volleyball on the court. This idea challenged me to develop “The Volleyball1on1 Formula” of what I felt “Great volleyball” looks like on the court when physically playing volleyball for both beach and indoor. Read about real example here! Easy to teach and understand for any player of almost any age. Applicable to any gender of team across almost any skill level. Based upon science and a proven formula for success. Malleable as a coach to allow for some discretion based upon the changing physicality of players and team attributes from year to year. Printable on a poster or shirt to help constantly remind players of the importance. Looking at the “Had to be list” above most are self-explanatory as a coach except the idea of incorporating science into the formula. That said I want to start by referring to some of the science this formula is based upon. The first, third and fourth most productive events in women’s volleyball all have to do with passing. The best thing we can do is pass a 3-point pass (one that is slightly off the net). Set 3-5 Feet off the net is the second best thing you can do in women’s volleyball. The third best thing we can do in volleyball is a 4-point pass (this is a tight on the net pass that a setter can easily attack if front row). The fourth best thing we can do in volleyball is a 2-point pass (a 2 option is a pass off the net near 10 foot line where we can only set the pins). A good pass, a perfect pass and an okay pass are more productive than a perfect dig, attack, block and serve in women’s volleyball. The fifth best thing we can do in volleyball is a Perfect Dig. Set 5-8 Feet off the net is the sixth best thing you can do in women’s volleyball. So how does this all translate to the culture we teach and the Volleyball1on1 Formula of “What Great Looks Like” on the court when playing? Every player on the team is responsible for developing a tough serve that they can hit in at a high percentage. For us this means all players learn to serve either a jump float serve, Japanese slide jump float or a jump spin serve at 85-92% that has some pace / speed. We have different barometers of speed based upon skill level. It is important to note this philosophy is slightly different on in-system plays vs out-system plays. In-system we are more tolerant of hitting errors vs. out-system where we want players to be more particular in their shot selection. We find unless this is a focus young players tend to make too many careless hitting errors where a smart shot would often result in a higher percentage for success. Passing higher, off the net and more middle the tougher the serve is a proven formula for success. Yet most coaches do not set expectations that a high pass in the middle at the 10-foot line is a good pass on a tougher serve. Given the science we help players set this as a self-ideal. Given the importance of setting in the science we set a very high self-ideal that all players learn to hand set or bump set the ball. For us bump setting is acceptable and encouraged in some cases for non-setters who lack the power or skill to overhand set. Given the science, our targets are 3-5 feet off the net for setters and non-setters have a target that is 5-8 feet off the net and 3-4 feet inside. We find this target inside and off the net for non-setters means we have less setting errors over the net or past the pins. For non-setters we want the sets to go up and down meaning sets are high and if possible create forward spin when bump setting. Important to note it is not just that players can set hittable balls but rather the team has a mindset that we need to create hittable balls to win. This is a very important distinction to understand as two often a ball is dug and one of two things does not happen. Secondly our two main attackers in transitions, our hitters in area 2 and area 4 are not ready to attack or make a good play on the ball as they did not pull off the net to get into a position to attack the ball. “Hittable Balls” means make a play to better the ball and put up a good set after the dig and hitters get yourself ready to attack that ball in a smart way. Players are re-enforced that making smart shot selections should be the primary focus with no hitting errors verses trying to get a aggressive kill in transition. Know the defense. (Example: Often players can still get a kill if they put the ball in the whole on a perimeter defense or down the line on a setter up defense). Take out the setter. (Teams sideout % tend to be significantly lower when the setter contacts the first ball). Hit the corners. (This is always a good thing to do when attacking, we find area 1 tends to be the best place to do this as hitter is not hitting the corner and taking out the setter). By having your players pursue this attack hierarchy we find it can significantly lower your opponent’s kill percentage when they dig a ball in transition. 1. Middle attack tends to have the highest hitting percentage and as such we try and set them first. 2. The right-side attack tends to have the second highest hitting percentage and as such we try and set them second. 3. The left-side attack tends to have the third highest hitting percentage and as such we try and set them third. 4. In most cases the back-row attack at the youth high school and club level tends not to be as effective as the front row attack and as such we tend to aim to set front row players before back row players. By also describing it as “Game Plan Offense” this give you tremendous flexibility as a coach to basically add in anything you see fit. “Offense” also covers half of all possible scenarios which allows for job crafting by the coach. 1. Our serve sets up our defense. We can OODA Loop any opponent if we serve tough. 2. Our goal is 2 or 3 players blocking on most plays. 3. “Reading the Game,” is the premier skill in volleyball and if we are struggling on defense it is likely because we are not in it “Visually” and not reading the game and opponents successfully! The feedback we have gotten this year from Volleyball1on1 camp coaches using the “Volleyball1on1 Formula” has been outstanding. The formula acts as a compass for players on how to play and act on the court. Coaches also love the clear expectations it creates on the players which most players regardless of their skill level can accomplish. 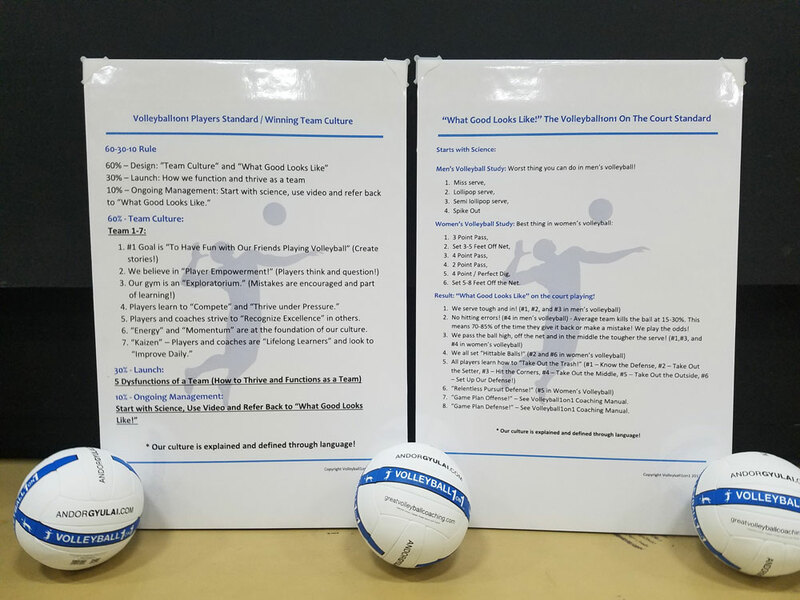 These expectations coaches then tie back to roles, responsibilities, commitment and accountability using “The 5 Dysfunctions of a Team” (Our system for teambuilding) with the result that players become accountable to themselves and each other to live up to expectations. We find the teams who implement our systems have players calling themselves out or each other out when not playing to the level of “What Good Looks Like.” An important life benefit is this helps improve individual and team leadership and can result in better team cohesion. * Please note: The 8 points and Volleyball1on1 Formula of “What Great Looks Like” is copyright and Trade Marked meaning you are not permitted to print or use it in any format without Andor Gyulai – Owner of Volleyball1on1 express permission. Team who run Volleyball1on1 High School Camps or Club Training’s pay to for the right to use this exclusive content! * We provide posters / shirts on this formula to teams we work with that can be used daily to help guide the teams actions on the court. If you are interested in running a Volleyball1on1 High School, Club Camp or Beach Camp please let us know and Andor Gyulai will schedule a call to review details with you. Volleyball1on1 offers a full volleyball coaching curriculum which covers all areas of coaches training. In most cases coaches training included on all camps and clinics (high school, club and beach) can be covered by the cost of the players camp. This includes coaching manuals and coach’s clinics. Contact Andor Gyulai (Volleyball1on1.com Owner) with questions!